Game developer Scott Cawthon never could have imagined the immense levels of success for his Five Nights at Freddy's video game series. Ever since the original computer game was released in 2014, the title has become very popular for gamers of all ages. Several video game sequels would be released in the following years, and there have been multiple attempts made to develop the story into a feature film. Last year, it was announced that Blumhouse Productions would be producing the project, and the film finally seemed to be making some traction. Unfortunately, however, Scott Cawthon has revealed that the film has been put on hold once again, due to issues with the script. A big name director had already been attached to the film in Chris Columbus, whose body of work includes helming Mrs. Doubtfire, Pixels, and two Harry Potter films. 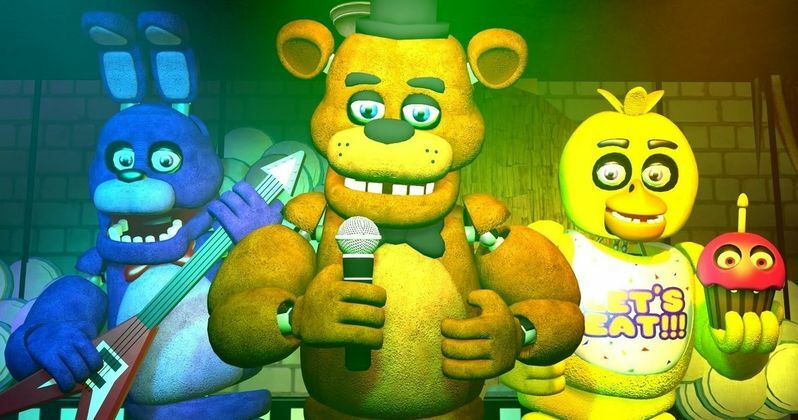 It was initially reported Columbus would also be writing, but according to Cawthon, he penned the screenplay himself, ensuring maximum faithfulness to the games the film is based on. But although Jason Blum of Blumhouse and Columbus were both happy with the script written, Cawthon personally had a change of heart about its story, opting to take it in a completely separate direction. As a result, Cawthon trashed the screenplay he had written, planning to start from scratch with an entirely new vision. "I hate delaying a project that's already seen so many delays, but I have to go with my instincts on what I think will be exciting and interesting, and what I think the fanbase will really want to see. If that means that I have to start over ten more times, then that's what I'm going to do. The good thing is that each attempt gets better and better, in my opinion. So, despite the delays, it's going in the right direction." When news of a Five Nights at Freddy's movie first hit the internet a couple years ago, Gil Kenan was attached to direct. For whatever reason, the project would stall until Blumhouse acquired the rights to produce the film in 2017, later hiring Columbus to direct. Although we are currently without a script once again, Cawthon has made it clear that the film will only be adapting the events of the first three entries in the video game series. The games to come out afterward, such as Sister Location, will not exist in the continuity of the feature film. For the sake of keeping things simple, this is probably for the best. Still, there's better news for the franchise's future when it comes to the video game series. Cawthon revealed he is hard at work on bringing several new entries in the series to life. A VR-version of the original game is nearly halfway completed, and it sounds horrifying just to think about. Among other titles, Cawthon says that a new "AAA" Five Nights at Freddy's game is coming as well. Additionally, console ports of the classic games are also in development, which will finally bring the game from computer screens onto television sets. A new line of books from Scholastic are coming as well, so there's still plenty to look forward to. We couldn't even begin to estimate when we'll finally see the Five Nights at Freddy's movie. The story will hopefully be in good hands under the creative guidance of Cawthon, so as long as he can make up his mind on its direction. Something that we're all hoping it has is practical FX and actual animatronics, as seeing the murderous robots in CGI would make them lose their effect. Hopefully the ball gets rolling on the project sooner rather than later. Cawthon's statement on the status of the film was originally printed at Steam. Five Nights at Freddy's Movie Happening at Warner Bros.